I am teaming up with other bloggers over at The Schoolhouse Review Crew to help you get ready for the holidays! Everyone is welcome to participate. Today's topic is DECORATING!!! Some people go all out for Thanksgiving, but unless I am gifted some pretty gourds, our house looks pretty much the same for Turkey day. We do, however, add a little sparkle to our house for Christmas. For the last eleven years, Michael and I have followed a routine of 'No decorating until December 24.' We have been more lenient with outside lights; it's so much fun to drive up to the house on a cold and wintry night and be greeted by a sparkle of color. I would probably leave them up year around if I could. The inside, though, is not decorated until December 24. 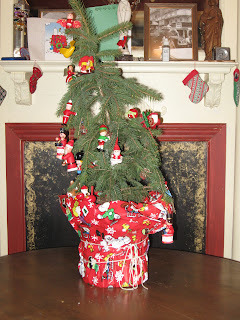 Since we usually cut down our tree, we bring it in the house and leave it bare until then. Some folks think we are nuts to wait so long to decorate when just the opposite is true. Christmas is a celebration of the birth of our Lord; you wouldn't decorate for a birthday a month or longer before the date. The decorations would seem stale and tired by the time the day was near. By decorating a few hours before Christmas Day we are ensuring that things are new and fresh. Holly and fresh greens are spread around, the tree is decorated, decorations are hung in doorways and on banisters. Christmas cards are saved until the night of Christmas Eve, and then hung by ribbons on the walls for all to enjoy. We keep it simple. The last thing I need at the holidays is to be overwhelmed by a messy house. Decorations that can't be touched by curious little fingers are kept up, others are down where they are constantly explored, moved, and sometimes destroyed. We try not to let these mishaps upset us, memories what we like to keep, not knick-knacks. Some years, especially those years that we travel, a potted tree and a few handmade stockings are all we can manage at home. And that's fine. We don't need tons of flashy ornaments to keep us in the Christmas Spirit. Sometimes less is more, and when we have more that's fine too! Waiting until Dec. 24th would definitely simplify the holidays. I love hearing my mom tell stories of hiking into my grandpa's woods to choose their tree on Christmas Eve. Someday I would love to be able to cut down our own tree!